Lausanne (SUI), 20 March 2017 – Representatives from the International Jumping Riders Club (IJRC) met with the FEI President and 1st Vice President in Lausanne (SUI) for a formal discussion on discipline specific matters that have generated considerable media coverage recently. FEI President Ingmar De Vos and 1st Vice President John Madden, who also chairs the FEI Jumping Committee, welcomed IJRC Board members Steve Guerdat, Kevin Staut and Francois Mathy jnr, IJRC Director Eleonora Ottaviani and Swiss Jumping athlete Clarissa Crotta to FEI Headquarters. The FEI was also represented by Maria Gretzer, FEI Executive Board Member and Chair of the FEI Athletes’ Committee, FEI Jumping Director John Roche, and Mikael Rentsch, Legal Director. Topics on the agenda included the proposal from the Alliance of Jumping Organisers to harmonise entry fees globally, which will be tabled for discussion at next month’s FEI Sports Forum. The FEI President, who has already publicly stated that he does not support this AJO proposal, clarified that the FEI has not taken any position on this matter and welcomes an open discussion on all aspects of the CSI/CSIO requirements. The Global Champions League, which is now an FEI approved series and fully aligned with the FEI Jumping Rules, was also on the agenda for discussion. Blood disqualifications, the risk of contamination during events and the resulting potential for adverse analytical findings, the FEI World Equestrian Games™, the athletes’ representative voting system, the criteria for National Federations to join the FEI, the ranking system, and the FEI Nations Cup™ were also discussed in full. The future of the FEI Nations Cup™ will be the focus of a session on the first day of the Sports Forum, which will be held in Lausanne on 10 and 11 April. “This was a much-needed meeting with the IJRC as there was a lot that needed to be clarified,” the FEI President said after the meeting. “Both parties had the opportunity to express their points of view and we had some very constructive dialogue. The meeting came at the invitation of FEI Secretary General Sabrina Ibáñez, who proposed during the Club’s General Assembly in Geneva (SUI) last December that the IJRC should send a delegation to FEI Headquarters early in 2017. Lausanne (SUI), 8 October 2014 – The International Jumping Riders Club (IJRC) and the International Dressage Riders Club (IDRC), which together represent the world’s top athletes, have signed Memorandums of Understanding (MOUs) with the FEI. 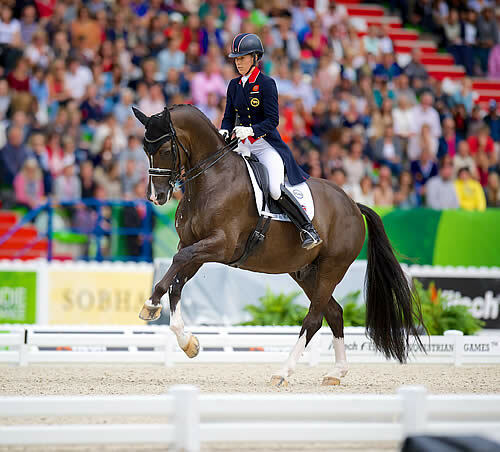 The two organisations, formerly FEI Associate Members, will work closely with the FEI to expand the Olympic disciplines of Jumping and Dressage. The number of Jumping events has grown by 20% since 2010, and Dressage events have grown by 28% in the same period, with over 1,300 Jumping and 450 Dressage events taking place in over 70 countries last year alone. The IJRC, founded in 1977 by a group of 25 international Jumping riders, including David Broome, Raimondo D’Inzeo, Paul Schockomöhle and Nelson Pessoa, is under the dynamic direction of Eleonora Ottaviani Moroni (SUI-ITA). The organisation represents over 250 of the world’s best Jumping athletes, which have competed at Olympic, World Championship and FEI Nations Cup™ level, as well as the top athletes in the FEI World Jumping Rankings – now the Longines Rankings. The IJRC also represents the North American Riders Group (NARG). The FEI decided in 2012 to use Memorandums of Understanding (MOUs) to better define its relationship with the different stakeholders. The MOUs cover universal issues such as FEI recognition, FEI Rules and Regulations, horse welfare, code of ethics, commitment to democratic processes, consultation, FEI General Assembly, FEI Sports Forum and meetings, governing law, dispute resolution, communication, and implementation. MOUs have already been signed with WHW, organisers and officials. Although recognition by the FEI does not entail voting rights at the FEI General Assembly, the MOUs formalise the relationship with the FEI, giving a voice to organisations working with the FEI in the development of equestrian sport. Geneva, 13 December 2013 – The International Jumping Riders Club (IJRC) and Rolex today announced that they have extended their long-standing partnership for a period of five years. Rolex has been the Official Partner and Official Timepiece of the IJRC since 2001. The long-term extension includes the brand’s partnership with the Rolex IJRC Top 10 Final, created in 2001 by the IJRC to showcase and celebrate the achievements of the 10 highest ranking show jumpers in the world. Rolex has been a major force at play behind equestrianism’s finest events, riders and organizations for over 50 years. The extended partnership between Rolex and the IJRC is a mark of a shared passion and commitment to the future of equestrianism, and exemplifies the values of excellence and the pursuit of perfection embodied by the sport, the IJRC and Rolex. Held for the first seven years at CHI Geneva, and most recently in Stockholm in November 2013, the Rolex IJRC Top 10 Final marks the crowning moment of the international show jumping season, when the top 10 horse and rider partnerships compete for year-end supremacy. The competition will return to the CHI Geneva in 2014 for a period of at least two years. The announcement was made today at the CHI Geneva, a pre-eminent jumping competition voted the best in the world for the sixth time by the members of the IJRC and one of the three founders of the newly established Rolex Grand Slam of Show Jumping. Rolex has been presenting sponsor of CHI Geneva since 1996.